1980 Philadelphia Phillies World Champions Team Signed 16"x20" Photo (matted & framed to 22.5"x26.5"). Photo of Tug McGraw from the 1980 World Series has been signed by (24) including Steve Carlton (inscribed), Pete Rose (inscribed), Mike Schmidt (inscribed), Dallas Green, Larry Bowa, and others. Includes COA from Hunt Auctions. 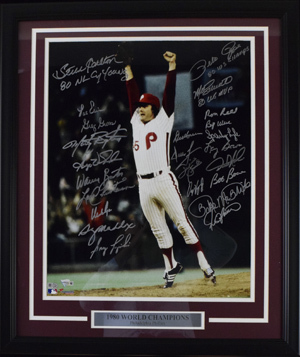 1980 Phillies World Champions Team Signed 16"x20" Photo (matted & framed to 22.5"x26.5"). Photo of Tug McGraw from the 1980 World Series has been signed by (24) including Steve Carlton (inscribed), Pete Rose (inscribed), Mike Schmidt (inscribed), Dallas Green, Larry Bowa, and others. Includes COA from Hunt Auctions.